This collaborative collection of comics representing a variety of voices and experiences was sparked by the concern that under President Trump abortion rights and other aspects of Obamacare would be under threat. The voices raised include women—single, married, non-binary—who have had abortions for a variety of reasons: lack or failure of contraception, sexual violence, lack of conviction that maternity was the right way for them at a particular point in time. We also hear from politicians and reproductive rights activists, and health care professionals all working in perfect marriage with cartoonists who demonstrate the power of the medium for economic depiction of complex issues. 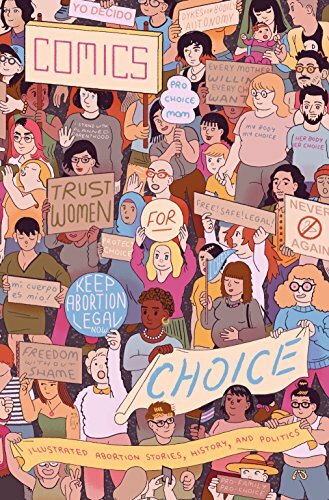 A number of comics take a more purely autobiographical approach narrating the obstacles encountered between testing positive and obtaining an abortion, with varying levels of support from partners, friends and mothers in the process. Leah Hayes’ “Sometimes I Can’t Sleep” is outstanding here. There is a lot of inspiring information as to how women have helped and continue to help themselves. The comic “Jane” (Rachel Wilson and Ally Shwed) on setting up a referral and counselling network which then blossomed into a fully illegal, and much appreciated abortion service is excellent, as is the much briefer “Plan C” (Nomi Kane and the Plan C Team) and the “Advice on Self Care After Your Abortion” by Rachel Hays. And Hallie Jay Pope in “Undue Burdens: How Roe v Wade Continues to Fail Poor People” and Steph Kraft Sheley in “They Can’t Get That From Us” both show how the structure of the health care system, additional discriminatory rulings, and the appointment of anti-choice justices still make access to abortion services difficult or impossible for many women in the States despite that watershed ruling. This is an important and timely collection that shows to best advantage that comics “have the power to connect with readers, challenge pre-conceived notions, increase knowledge, and ultimately tackle stigma.” The main challenge will be having the collection circulate beyond the already converted.